Having to replace your air conditioner unexpectedly is one of the worst feelings a home-owner can have. It can be even worse if you own a home in an area where you don’t live. Replacing an AC is one of the largest expenses in the life-cycle of home ownership, so we try to make it as painless as possible with our option to finance the transaction. There are however some unique challenges in processing a financing transaction for an absentee owner. Below are our options for payment for an air conditioning replacement for an absentee owner. Pay us directly with check for the full amount (check must arrive to our office in Clermont, Florida before installation can be completed, but check will not be cashed until work is completed). Pay us directly with credit card for the full amount (credit card must be loaded into our back-end system before installation can be completed, but card will not be run until the work is completed). Finance the transaction through Wells Fargo (all paperwork must be signed, completed and mailed back to our office in Clermont, Florida before installation can be completed, once completed the first bill will arrive in the mail from Wells Fargo approx 30 days after the installation). Wells Fargo, our main source for financing new air conditioning systems, has a key component within their process: confirming the identity of the financing applicant. When we can’t meet someone face-to-face, there are a few added steps in the process. Wells Fargo will come back with 1 of 3 results, Application Denied, Application Pending or Application Approved for $_____ (depending on the application different amounts of capital will be offered). Once you’ve chosen your terms, we will print out documents, fill them out and meet with you in person (if you are in the local area) or mail the documents to you if you are out of town. You must sign these documents in the presence of a Notary Public and mail them back to us in the postal mail (no email is allowed). We hope this has been helpful, please let us know if you have any questions along the way and feel free to call our office anytime! Here are the five things that you need to make sure gets done before and during your blown in insulation project. These steps will make sure your company actually does a quality job. I can’t tell you how many times we’ve gone behind the other blown insulation contractors here in Florida and seeing that they either, don’t even attempt to do what should be done in terms of performance or under deliver on what they promised and don’t actually finish what is needed. Here in Florida, it is scorching outside and one of the things that you can do in order to help make your home more energy efficient is to add a layer of insulation between that heat and your livable space. The work is not necessarily highly skilled or hard work in terms of needing immense education to understand its process, but it does take commitment and hard work to actually put into practice. Attic temperatures here in Florida can sometimes reach up to 150 degrees, so it’s important to make sure that the company you choose takes employee safety seriously and trains them properly. 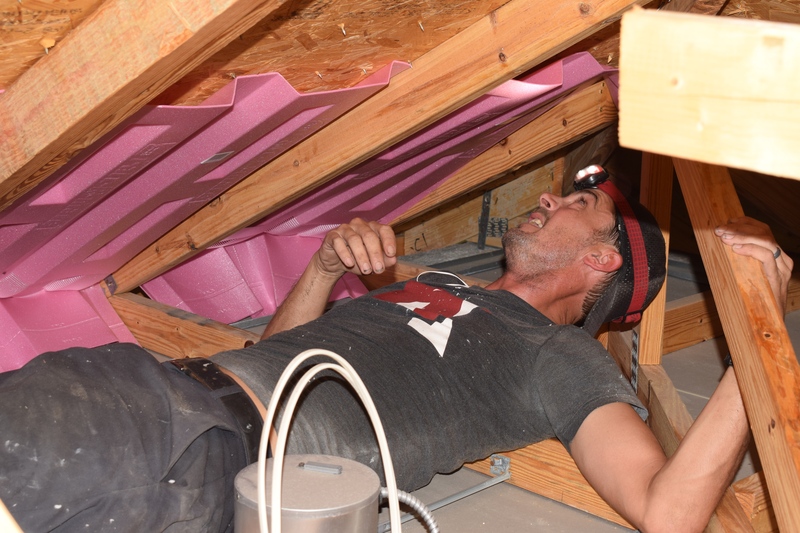 Once you’re up in an attic for more than about 10 minutes, it’s easy to start cutting corners, so proper training and leeway for needed rest are both key. Many estimations in this business do not take the proper time to evaluate how exactly an attic should be treated. About three quarters of the time the other estimators from another company will simply ballpark the situation from down below in the cool living space so that they don’t have to get into the attic, sweat, and get their eyes on what’s actually going on up there. In our company’s expert opinion you have to actually look at something in order to know how to properly quote it. 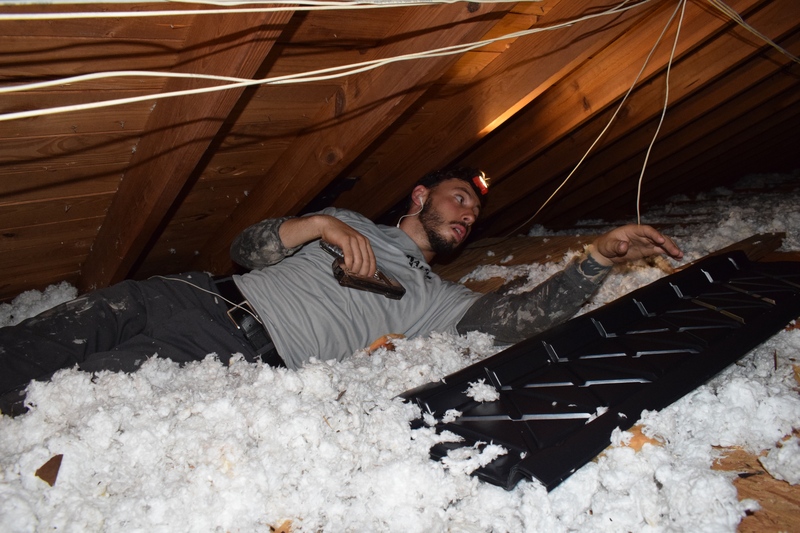 There are a lot of different variables involved with quoting blown in insulation and there’s a lot of different solutions out there, so in general, make sure that your estimator actually gets up into the attic for about 10 minutes or so to get a good look at everything and take some photos. The estimator should go over the whole plan with you and tell you exactly what you need while also visually showing you. More than likely you’re not going to follow an estimator up into the attic in order to see what they’re talking about, so you have to take their word for it. However, make sure that they give you some photos and that the photos are trustworthy. We have found that most homes are pretty leaky, and need to be improved with some ceiling work. A lot of times when somebody is insulating and get quotes for blown in insulation here in Florida, they are insulating a new edition where they are insulating perhaps a lanai or their garage. There are probably a lot of penetrations into the attic ceiling that had been left unsealed by the general contractor in these areas. This allows for a lot of, not only heat, but also humidity infiltration into the space. Whenever we quote a customer for blown in insulation, we offer to both seal and insulate the area. We quote this as a package is because once there is a lot of blown in insulation in your way, it only makes it harder to actually seal up. 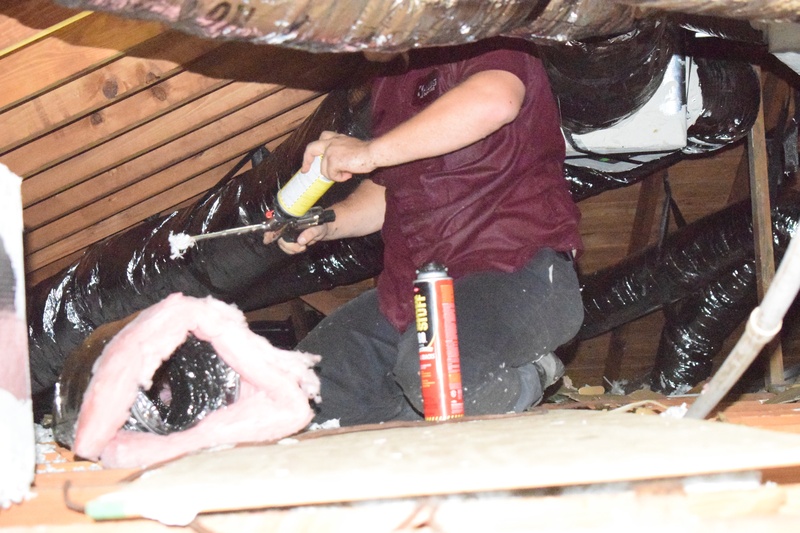 In order to make sure that the blown in installation is the most effective insulator that it can be, we seal any penetrations into the attic using a Fonville spray that we install the morning of the blown in insulation job. This expands to fill any cracks or penetrations in the attic. Can-lights are the sort of light that sits flush with the ceiling of your living space, but is actually recessed up into the attic. It’s very important to make sure that these are actually seal themselves rather than trying to use any sort of spray fall around them. Reasons being that there are electrical processes involved. We never want to compromise any of that kind of material with anything that is flammable. We have found that in The Villages, for example, can-lights are almost exclusively used to light lanais, and they are almost always unsealed and allow the air between the two spaces to mix one way some installation contractors mitigate. 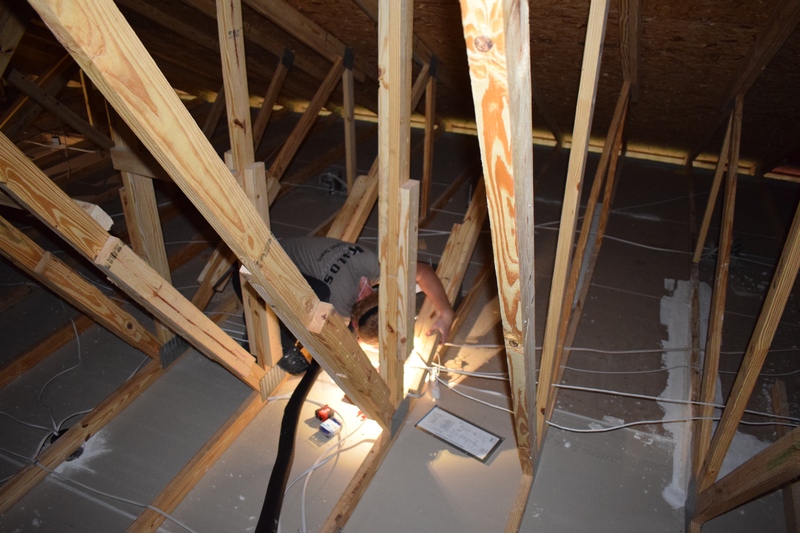 We install a cone above each can light, allowing the area to be sealed from the rest of the attic, and not be touched by the new blown in insulation. That’s not a bad way to accomplish the goal of sealing it, but it’s preferable to buy pre-sealed can-lights and install them to replace the existing can-lights in the space. Many of these sealed the can-lights are actually LED, more energy efficient, and in the long run saving you money on your power bill. As licensed electrical contractors in Florida, we can offer solutions like installing these sealed can-lights, which can accomplish better energy savings. In general, there are a couple of different types of ways you can get up into an attic. There’s usually either a set of pull downstairs or there is a piece of drywall with a frame that gets pushed up, a large hole is then exposed to allow access. Many homes in Florida have the benefit of having an attached garage at the front of the house, so the easiest place for the attic access was to install the pull-downstairs or push-up entrance in the garage space. Unless you are looking to add blown in insulation into your garage, this is not an area of concern, however, if your attic access is actually within the space that you are looking to either cool or insulate, this is a huge point of heat infiltration. 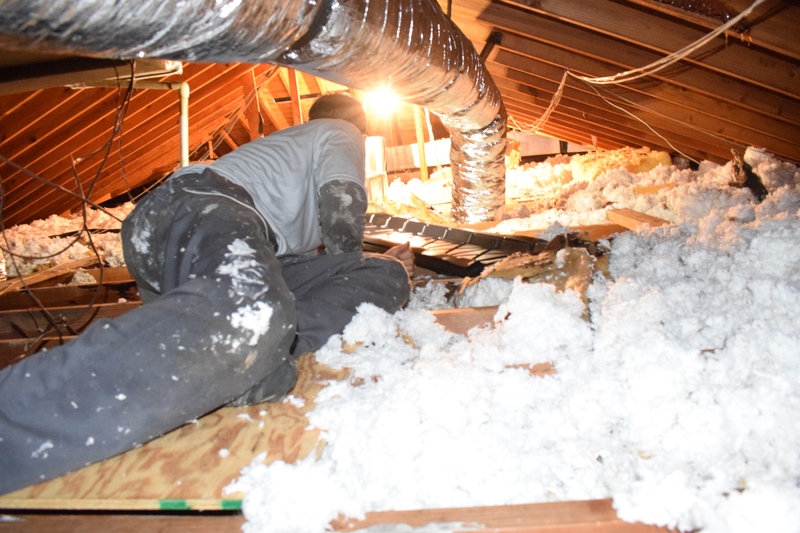 If you ever tried to push into an attic entrance that just has blown in insulation all around it, you’ll know what a mess it makes whenever you open the attic. Hatch and blown in insulation tumbles down into your livable space to avoid this and to allow for less heat infiltration. We actually suggest to install one of two solutions. The first one that will help just keep the area around the attic hatch clear from any blown in insulation is install a barrier wall around the attic access. We built a small barrier wall, a foam board, in order to keep the blown in insulation from falling down into your livable space, you’ve paid for us to blow in the insulation, why would you want it to just fall down and be something that gets vacuumed up or thrown away every time that you go into your attic? Secondly, we would suggest a large bag filled with insulation and placed directly on top of the attic hatch a stairway, insulate it. Stairway insulator is going to be a little bit different style, but essentially if we’re talking about having a moveable piece of insulation that sits on top of the attic hatch entrance can be placed back whenever the needs to be closed up. This allows for you to make sure that you are not having a ton of heat come through your attic hatch access point, but at the same time and not have a giant mess every time you open it up. Many contractors leave this step out of their job, they leave it out because it’s simply just not easy, and takes time. Almost every home has a breathable soften around the outside edge of the home. This is meant to allow air to infiltrate up into the attic from outside, allowing the attic to breathe and ventilate out of the ridge vents in the top of the roof. This allows for there to be exchanged in the attic so it doesn’t just sit stagnantly increasing in heat. Many people don’t know that their attic is actually open to the elements outside, but if it’s beneficial to do so in a controlled manner. The last thing that a customer wants to do when starting one project is to create additional follow-up problems without these baffles in place. The problem we see many customers have when they hire an unqualified blown in insulation contractor, is that the blown in insulation usually falls directly down onto those soffit vents and close them up, not allowing for air to enter the space and ventilate through to the Richmond at the top of the attic. Essentially they are ceiling in that space and when they do so, they’re actually creating a higher level of humidity and a myriad of other problems. The solution to this is to staple cardboard core polyurethane baffles between each of the trusses in the attic. This allows for a natural barrier to be formed allowing the blown in insulation to be bonded right to the edge of the attic space without ever falling onto the soffit. Another central part is to make sure that the baffles are tall enough for the amount of installation that is being installed. The thicker the installation, the taller the baffled needs to be. Unfortunately, it is not too easy. Essentially one will need to be on their back, should been through the attic, stopping at every trust bay, and stapling these baffled into place one by one. Take a look at our video below to get a better sense of this. Here within our five points the prep work is everything. 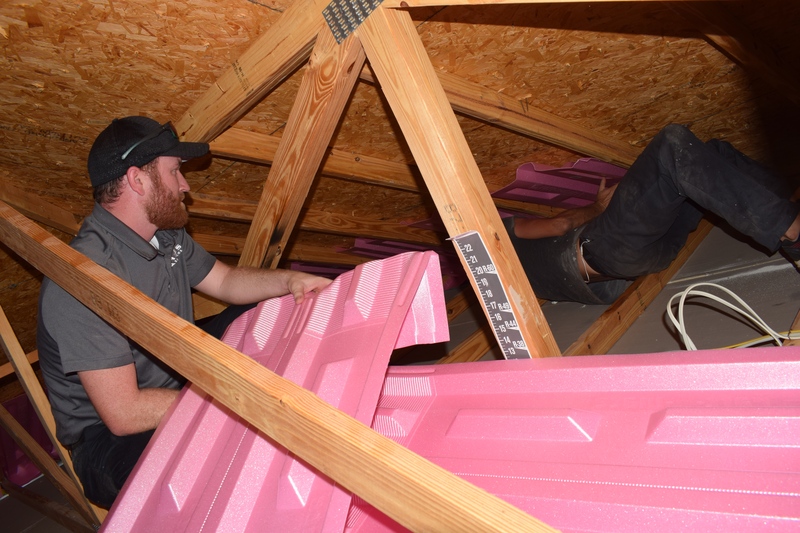 The blown in insulation portion is actually the easiest part of the job, but if the preparation is not done properly you will be setting yourself up for a long list of problems in the future. Make sure you work with trustworthy and detail oriented technicians to save yourself the headaches. If you have any questions, please feel free to give our office a call at 352-224-3708 or visit us online at kalosflorida.com/installation. Many homes in the short term vacation rental market now have a pool heater, but many managers are unsure how to properly care for them. Pool heaters can be a great amenity when closing a booking for a home. Unfortunately, when there is an issue with the pool heat, it can cause a lot of guest complaints– and that’s what happens with pool heaters that aren’t properly maintained or cared for. 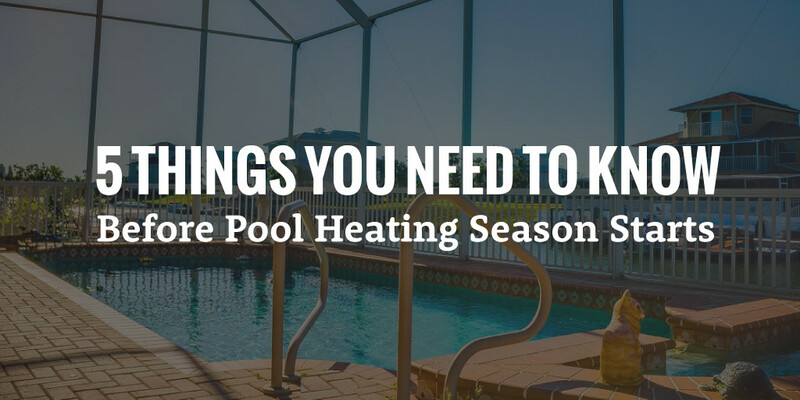 As most property managers know, pool heaters in Florida don’t have a long life expectancy (heat pump pool heaters usually last 6-10 years while gas pool heaters usually only last 2-5 years). Even in a warm weather climate like ours, pool heaters will have long run-times, are exposed to the harsh sun and other outdoor elements, and are exposed to plenty of corrosive elements and chemicals that are within the pool’s water. Water temp sensors, capacitors and heat exchangers are just some of the common failures that can turn your amenity into a headache. Turn the pool heater on several days in advance to make sure the pool is up to temperature BEFORE the cold snap. If you wait until it is cold outside to turn on a heater they may never catch up until the cold period ends. Increase the pump’s run time before the cold weather – we recommend setting an 8AM to 8PM as standard schedule. Have the guest cover the pool at night. If you can get them to do this it will GREATLY assist in the pool temperature, and the energy efficiency will help you save on power usage as well. Do not run a heat pump overnight during cold temperatures. Many pool heat pumps will ice over and require manual defrost if you do this, adding avoidable (and expensive) pool heater repairs. Take care of issues ahead of time by scheduling annual maintenance on the pool heater. Catch small issues before they become larger ones, monitor trends, and improve your guest’s experience by being prepared. You can save yourself money, time, and grief by doing this, even if it feels unnecessary at the time. For proper and consistent pool heater maintenance or pool heater repairs, please call our office at (352) 243-7088 and learn more by subscribing to our blog. The fact that you’re reading this means you care about protecting one of the biggest investments you’ve made: your house. Smart homeowners know that proactive and regular home maintenance is essential to preserving the value of your home — without it your home can lose 10% of its potential value! We certainly believe in regular home maintenance on your air conditioning unit, but there is a lot of other jobs to keep up with as well. We’ve included a good list below that we found here in order to help you stay current with all of the jobs you should be current on. We hope it helps! As you go through this home maintenance list, don’t be afraid to reach out to our service partners or ourselves if we could be of assistance! Organize your home improvement files. Review warranties and product manuals to check on recommended maintenance for furnaces, equipment, appliances and tools. Mark your calendar to track scheduled upkeep and service. Inspect furniture, cabinets and vanities for loose knobs, pulls and hinges. Tighten or repair as necessary. Lubricate squeaky door hinges with lightweight machine oil. Free sticky doors by trimming edges or shimming hinges with thin pieces of cardboard. Fix squeaks in floors and stairs by applying weight to the area (having a partner stand on it works) and driving an 8d or 12d galvanized finish nail through the flooring into a floor joist or stringer. If you have access to the floor from underneath, glue and screw backs to the floor or treads and to the joist or stringer. Look for bargains on discontinued appliances and tools. Before buying, make sure that warranties are valid. Make a room-by-room inventory of everything in your house. In the event of fire, flood or other disaster, it will be important in filing an insurance claim. Photographs or video of your possessions can also be helpful. Don’t close vents to crawl spaces. If you live where pipes can freeze and the floor becomes very cold, insulate pipes and under the floor. Vents play an important role in controlling condensation beneath a house. Double-check insulation around exterior pipes that are exposed to freezing weather to be certain that water cannot seep under the insulation. Remove drain traps under sinks and clean them thoroughly. Clean pop-up drain plugs. Inspect the linkage for pop-up drains to make sure they are set properly. To adjust the linkage, squeeze the finger-operated pressure lock to release it and slide it up or down as necessary. Inspect grout and caulk around tubs, sinks and showers. Chip out cracked grout and replace missing grout. Stained, discolored and mildewed caulk should be cleaned with trisodium phosphate or other household cleaner. If the caulk remains discolored, remove it and replace it with fresh, mildew-resistant caulk. Refinish furniture in a heated garage or workspace equipped with ventilation fans. Otherwise, use water-based strippers, paints, stains and varnishes that are especially formulated for low odors. Musty closet odors can be reduced or eliminated by removing the closet’s contents and washing walls with a diluted solution of chlorine bleach. In addition, try replacing solid doors with louvered doors. Note: If the mustiness is the result of moisture, find the source and correct it. Otherwise the problem will come back. To keep valves from sticking and check for leaks, turn all water valves off and on. This includes outdoor faucets and valves to toilets, bathroom and kitchen sinks, laundry, bar, etc. Review the contents of your medicine cabinets and throw away dated prescriptions and over-the-counter medicines. Be sure all medicines are out of the reach of children or contained in a cabinet equipped with childproof locks. Celebrate spring by cleaning the garage. Hold a yard sale, or organize a community yard sale with neighbors. Dispose of paint thinners, household cleaners and pesticides properly. Contact your city’s department of public works to find out the next scheduled collection of hazardous materials. Clean the refrigerator, inside and out, with mild detergent. Remove all trays and shelves, wash, and allow to dry thoroughly before replacing them. Remove old ice from ice-making tray. After heavy rains, inspect your basement walls for signs of moisture. If you detect wetness, run a portable dehumidifier. If condition persists, consult a waterproofing contractor. Check to make sure your sump pump works properly by pouring water into the pump silo to raise the float and activate the motor. Test the pressure and temperature relief valve on your water heater by opening it and allowing some water to flow out. If little or no water flows out or it doesn’t shut off, replace it. Bad valves can cause explosions. Spring is a good time to build a doghouse. Make sure to provide adequate roof ventilation to allow hot air to escape. And don’t use pressure-treated wood in any area where your dog might chew it. Daylight Savings Time begins. 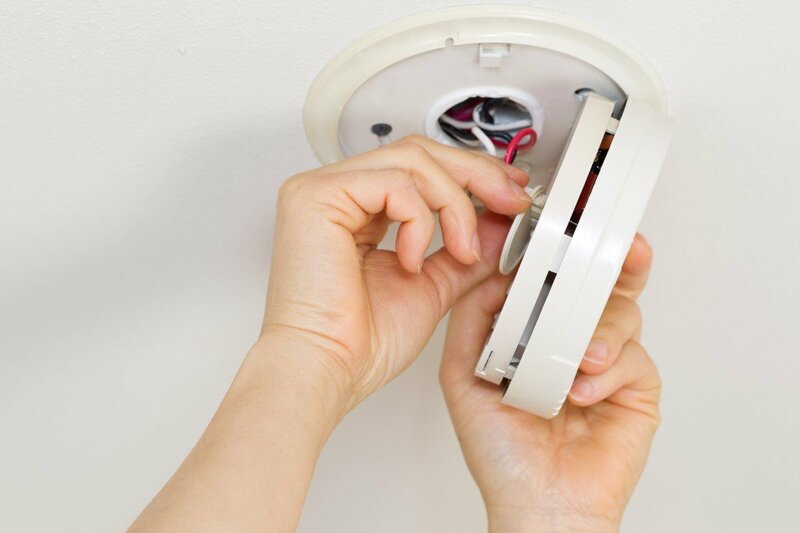 Honor the occasion by replacing batteries in smoke and carbon monoxide detectors. Inspect screens (both house and vent screens to attic or crawl space) for tears and bent frames. Check screens (both house and vent screens to attic or crawl space) for tears and bent frames. Clean window screens. Lay them flat on a picnic table or a pair of sawhorses and scrub them with a soft bristle brush and a mild detergent solution. Rinse with a garden hose and allow to dry thoroughly. Inspect outdoor structures for deterioration – especially signs of rot. Use a small awl to probe posts, railings and window sills for soft spots. If you find any, plan to replace or repair them when the weather turns fair. Prepare for the outdoor cooking season by inspecting gas grills. Remove cooking grills and thoroughly clean them with soapy water and a brush with brass bristles. Remove accumulated grease from lava rocks and ceramic briquettes by turning them over and igniting the burners. Allow 10 minutes on high heat to clean the briquettes. Inspect garden hoses for leaks. Make temporary repairs with electrical tape. Pry out old washers and replace them. Don’t leave hoses connected to outdoor spigots until the danger of frost is completely over. Caulk open joints, particularly around windows and doors. Inspect the crawl space or basement after rains for water accumulation or excessive moisture. Look for signs of water damage on the subfloor and joists beneath bathrooms, the kitchen and laundry. Find and fix leaks now or pay the price later. Shut off the water to the washing machine, remove the water supply hoses and examine them and the washers. Replace worn and damaged ones. Check fire extinguishers to make sure they are not outdated, have lost pressure or are damaged. Check all weather stripping around doors and windows for wear, damage or loss of flexibility. Replace material that is no longer blocking air. Clean your garbage disposal. Grind two trays of ice cubes made from a mixture of one cup white vinegar to one gallon of water. Clean gutters. Inspect gutters to ensure all spikes, straps and clips are tightly fastened. Use a garden hose to flush debris from downspouts. Make sure downspouts or splashbacks direct water at least three feet away from the foundation. Wash windows, inside and out, using a solution made from three tablespoons of nonsudsy ammonia to 1 gallon of water. Don’t work in the direct sun – the solution will dry too fast and streak. To clean windows with real (not removable) grills, use a hacksaw to cut a squeegee so it fits the windowpanes exactly. Have central air-conditioning unit checked according to the recommendations of the unit’s manufacturer. Replace the filter in the forced-air system. Clean debris from condenser or heat pump located outside. Remove mineral deposits from faucet aerators and shower heads by soaking parts in white vinegar and scrubbing with an old toothbrush. Have swimming pools cleaned. Inspect and service pool liners and filters. Shop for seasonal sales on air-conditioning units and window fans. Before placing metal patio furniture outdoors, coat it with auto polish. Clean and seal decks. Ideally, you’ll need three consecutive warm, sunny days. On day one, dry out the deck. Apply deck cleaner and scrub the deck on the second day and let it dry 24 hours. On the third day, apply deck sealer. Wash the exterior of your house, using ordinary garden hose pressure and a mild detergent. Beware of the pressure washers – they are powerful enough to force water under the siding where it may encourage mildew and rot. Caulk exterior joints around window and doors. Clean lint from the entire clothes dryer vent system, from the dryer to the exterior vent cap. Inspect and repair or repaint all patio and deck furniture. Check operation of attic fans and roof-mounted turbine vents. Check all exterior walls for peeling or cracked paint. If you decide to repaint your house yourself, you can cut this job down to size by painting just one or two walls per year. Typically, paint on south and west-facing walls deteriorates faster and requires more frequent recoating than paint on north or east-facing walls. Carefully inspect brick or masonry siding for cracks or missing mortar. Repair with fresh mortar or concrete caulk. Inspect roofing material for cracks and loose or missing shingles and repair as necessary. If you have access to attic spaces, check underneath the roof for stains that indicate leaks, especially from “flashed” areas in roof valleys and around chimneys and vent stacks. Inspect the operation of automatic light timers and motion-detector systems, especially if you plan a vacation. Prune trees and shrubs so that branches do not come in contact with exterior siding. Clean and repair cracks in concrete driveways using epoxy patching material. Repair asphalt driveways using asphalt patching material. Seal asphalt driveways every other year. Inspect foundation walls for signs of termites –- tunnels or dirt bridges. If you suspect termites, contact a professional exterminator. Use a vacuum with a narrow nozzle to clean condenser coils on the back or underneath your refrigerator. Check faucets for leaks and replace washers or repair the faucet as necessary. Clean underneath range hood. Remove and clean or replace range hood filters. Fix “water hammer” noises by draining the plumbing system. Open the uppermost faucet (or the one furthest from the water meter) and the lowest (or closest to the meter) and allow the water to flow to a lower-level sink or floor drain. Draining the system restores air to air chambers. Close the lowest faucet and refill the system. Plan interior remodeling projects and get estimates. Plan for the work to be done in early fall. Paint interior rooms while it’s still warm enough to leave windows open. Ditto for shampooing or replacing carpets. Check heating system including filters, pilot lights, and burners, and have the system serviced by a qualified professional. Clean and vacuum dust from vents, baseboard heaters and cold-air returns. Remove window air-conditioning units and store them. If they are not removable, cover them with plastic to protect them over the winter. Tour the outside of your house to make sure that soils around the foundation are properly graded. Soil should slope four to six inches for a distance of three feet out from the foundation walls. Watch for year-end close-out sales on lawn and garden equipment. Inspect storm windows for any signs of deterioration and make necessary repairs. Detach hoses in case of freezing temperatures. Remove all paints, caulks and liquid materials from garage or garden sheds. Inspect weather-stripping around doors and windows and repair or replace if necessary. Set thermostats and automatic sprinklers for winter. Clean gutters after leaves have fallen. Make sure downspouts are in good repair. Check gauges on home fire extinguishers to ensure a full charge. Replace if necessary. When setting clocks back to Standard Time, change batteries in smoke and carbon monoxide detectors. Inspect automatic garage door opener and lubricate according to the manufacturer’s directions. Make sure all bolts and screws are properly tightened and secured. Check for leaks around washing machine. A prime suspect for leaks are the water supply hose washers. Inspect hoses and replace if necessary. Clean dishwasher, trash compactor and countertop appliances. Check the operation of all ground-fault circuit interrupter outlets by pushing the “test” button. The “reset” button should pop out, indicating the receptacle is operating properly. Press in the reset button. Check inside bathroom vanities and kitchen sink cabinets for moisture and other signs of leaks. Carefully inspect pipes for condensation or slow drips. Repair the plumbing system if necessary. Review the family fire escape plan with every household member. Unpack and test all electrical holiday decorations. Repair or discard any that do not function properly. Watch for sales on tools before and after the holiday season. We hope this detailed guide to home maintenance was helpful!